Trusted parasite prevention and now shampoos to clean and care for your pet’s coat and skin. Read about the range. Here’s where you can watch a video on how use our products and have all your questions answered. Search our Store Locator by suburb to find locations and purchase FRONTLINE near you. 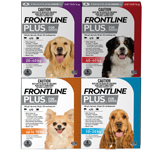 Have questions about FRONTLINE® brands, or something else about fleas and ticks? Contact us, we’d love to help. Care for the sensitive skin and fine hair of puppies and kittens with gentle, moisturising PUPPY & KITTEN SHAMPOO. Delicately fragranced with milk and honey, it gently cleanses and conditions, leaving the coat clean and soft, without drying or irritating the skin. Mild, soap free conditioning formulation. No added sulphates, colours or parabens. 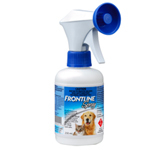 FRONTLINE PET CARE shampoos are not designed to kill fleas. However, they are formulated to be suitable for use with long term flea control products. 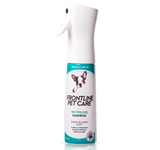 Make shampooing a stress free experience using our FRONTLINE PET CARE range. Wet the coat thoroughly with clean warm water. Apply at at least 20mL of product (about the size of a 20 cent coin) to several places over the coat, avoiding pet's eyes and ears. Gently massage into the coat before rinsing. Use FRONTLINE General Coat Care Shampoos weekly or as required. Check your pet regularly. Taking care of the small things early can save them from bigger issues later on. Looking after your pet’s skin and coat can help make them feel and look great! All content in this document is the property of Boehringer Ingelheim Animal Health Australia Pty Ltd and is protected by copyright. You may only use this document for informational, non-commercial, and personal use purposes. You may not modify this document, publish or commercially broadcast it in part or in full (including on a network computer) without our prior written consent. This notice must be retained in all circumstances. Copyright © 2018 Boehringer Ingelheim Animal Health Australia Pty Ltd. All rights reserved.